MarkDaniels.Blogspot.com: Is this a Christian way to pray? Yes! Below are reflections from my quiet time with God today. I met God at Psalm 58 in His Word. To see how I approach quiet time, see here. Psalm 58 is an example of what the scholars call an “imprecatory psalm.” To imprecate is “to invoke or call down (evil or curses) as upon a person." Those outside the faith or casual Christians who read imprecatory psalms can be horrified, even offended. They see these psalms as arguments against the transforming love of God that Christians claim is at work in believers or even as arguments against God Himself. “How could a person filled with the love of Jesus pray such things?” they wonder. In fact, these psalms demonstrate how important it is for believers in the God revealed now to all people in Jesus to be utterly honest with God about what we’re thinking and feeling. He knows all about us and our “moods.” In Psalm 139:4, we confess to God, “Before a word is on my tongue you, LORD, know it completely.” It’s futile to think that we can conceal from an omniscient God the kinds of sentiments to which imprecatory psalms give expression. God wants us to be completely honest with Him, as is appropriate for someone who is your best friend. The third thing to be said in favor of imprecatory psalms is that their perspective can sometimes reflect God’s perspective. When we see injustices perpetrated against others, our anger toward the doers of injustice matches God’s anger toward them. There is such a thing as righteous anger, anger born of God. Those who misuse or abuse earthly power of any kind to perpetrate injustices against others, who take refuge in the laws of this world rather than in God and His gospel will, at the final judgment, stand naked in their misdeeds rather than be covered by God’s grace given to all who trust in Christ. The apostle Paul writes, “Do not be deceived: God cannot be mocked. A man reaps what he sows” (Galatians 6:7). 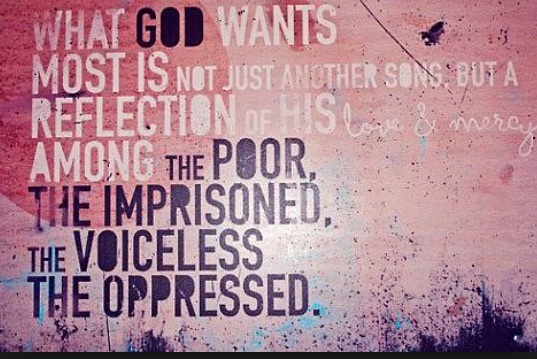 In the imprecatory psalms, we find a model for acknowledging injustices and asking God to bring justice about, whether that justice comes in this world or in the one to come. Imprecation in our conversations with God is one aspect of a healthy faith. Listen: In Psalm 58, David is specifically railing against the injustices of rulers. He cries out to God to defang these rulers, to cause them to vanish. When that happens, he says, the righteous, those who depend on God for life and holiness, not themselves, will be glad, dipping their feet in the blood of the evildoers. Tough talk. Not the kind of talk believers might express when they’re talking to their unbelieving barista at Starbucks. But if we bring such sentiments before God, God will understand. God will hear it as prayer and respond. Think of the bloodthirsty tyrants in the world today. Take Vladimir Putin, who has murdered, jailed, and confiscated the property of his political opponents at home, invaded Ukraine, ordered the bombing of innocent civilians and medical convoys in Syria and Chechnya, poisoned opponents granted asylum in democratic nations, stolen his country blind, tampered with democratic nations’ elections, and been an enabler for Bashar al-Assad’s murderous regime in Syria. If anyone deserves to be defanged and to vanish from the earth, it’s Vladimir Putin, this evil man. That’s why I go to God each day and ask for his peaceful removal from power. I also pray that his henchman will be removed from power. I pray similar prayers regarding other bloodthirsty rulers. I pray that those who abet the bloodthirsty will be given God’s wisdom and an openness to that wisdom or, barring that, that they too will be removed from office. I pray, as Scripture teaches Christians to do, for all leaders, that God will help them to rule not with their own wisdom, but with the wisdom of God Himself. Political activity has its place. Personally, I try to be an informed citizen, I vote, I send emails to government leaders, I make political contributions. As a pastor, I feel it would, except in the most extreme of circumstances, be inappropriate to be politically active: I don’t want people to confuse my political preferences for the Gospel I am called to proclaim. But I also am part of a Christian tradition, Lutheranism, that encourages believers in Christ to be involved in the world for the sake of others. Whether it’s in our prayers or in our voting, Christians should never be about their own interests, but about what is in the best interests of their neighbors, Christian and non-Christian alike, those living today and generations yet unborn. I follow a Savior Who calls me to take up my cross and follow the same path He took through this world. He underscored the Old Testament law that we love our neighbors as we love ourselves. If my anger at unjust rulers or my quiet act of voting is ever in response to my self-interest, I’m in the wrong. Always. If my anger at unjust rulers or my voting is in behalf of the lowly, the poor, the powerless, the overlooked, the despised, the abused, the underappreciated, the endangered, the held-down, my anger is righteous. But the very first thing we need to do with our righteous anger is take it to God. When we do that, He can lead us in discerning how best to express and live out indignation born of holy love.